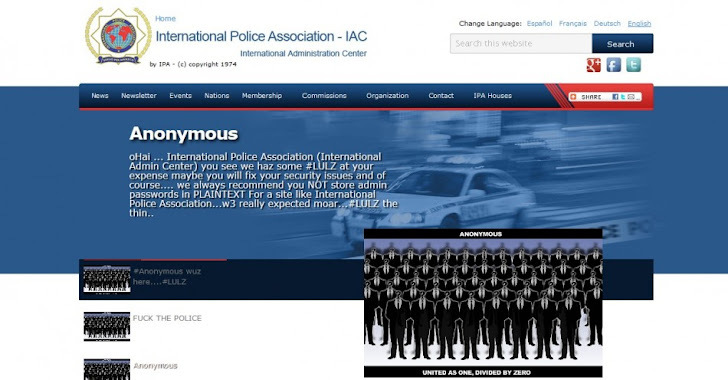 Anonymous hackers deface International Police Association http://ipa-iac.org (IPA) on Friday afternoon and Anonymous hackers responsible left an angry message on the website's homepage, stating that they defaced the page "for the lulz" (for fun) but also warned that they might have stolen some "sensitive data." A message posted at the top of the page reads, "oHai [hello]... International Police Association (International Admin Center) you will see we haz [had] some #LULZ at your expense maybe you will fix your security issues and of course... we always recommend you NOT store admin passwords in PLAINTEXT For a site like International Police Association... w3 [we] really expected moar [more]... #LULZ the thin..."
The International Police Association is the largest organization for police officers in the world according to Wikipedia, and is not connected to Interpol http://www.interpol.int/ . The IPA was founded by English police sergeant Arthur Troop in January 1950 under the model "Service Through Friendship" with the goal of creating friendly links to encourage cooperation between police officers across the world. The organization currently has around 400,000 members in 64 countries. Its main offices are based in Nottingham, England. The message continues to boast that Anonymous cannot be stopped because "There is no head to cut off motherfu--kers!!!" Before concluding with the words, " F--k the police!!!!"